Produktinformationen "MiniFlex SHDSL.bis DIN-Rail Modem"
FlexDSL MiniFlex SHDSL.bis and Optical Mini DSLAM. The FlexDSL MiniFlex platform is a special part of the Orion3 product family. Beside of having up to 10 dual Orion3 SHDSL.bis Extended line cards there is a feature-rich managed layer 2 Ethernet switch included. This switch has 8 auto-sensing front accessible 10/100Base-T ports as well as 2 gigabit Ethernet ports with fiber connectivity (SFP) and 2 gigabit Ethernet ports with copper connectivity (RJ-45). 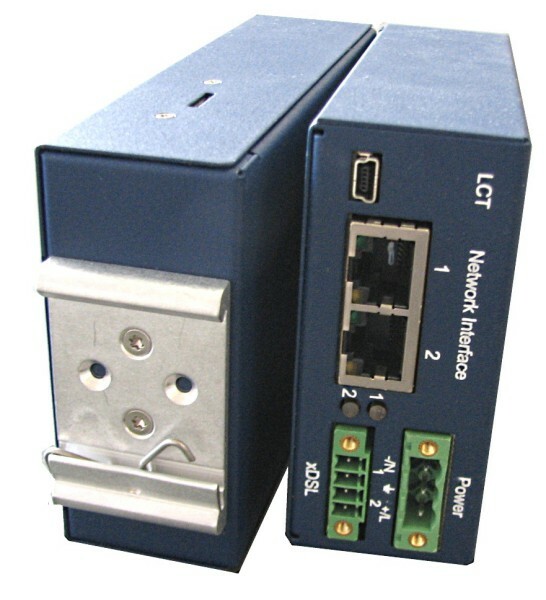 The inside backplane connects this switch to all Orion3 line cards through additional 10 Ethernet 10/100 Base-T ports. The FlexDSL Orion3 SHDSL.bis Extended product family offers a broad range of products, which are based on the latest SHDSL.bis standards (ITU-T G.991.2 & ETS TS 101 524), while also being fully interoperable with all our existing SHDSL equipment (Orion1 & Orion2). SHDSL.bis Extended allows symmetrical data transmission at speeds up to 15.2Mbps over a single pair of copper. In addition, the dual Orion3 line card also supports DSL channel bonding for 2 copper pairs in order to achieve speeds to 30.4Mbps! Using the link aggregation feature of the additional integrated switch, the FlexDSL MiniFlex can transmit up to 300Mbps over 20 copper pairs. This incredible speed makes Fiber installations in a lot of places needless. In addition to SHDSL.bis, the MiniFlex platform supports subscriber access over Fiber Optic. The optical line card has built-in SFP jack for standard 100 or 1000 Mbps Ethernet module. The protocol is compatible with third-party switches, media converters, etc. Like all FlexDSL Orion products, the MiniFlex and its line cards are based on industrial components and are manufactured according to highest quality standards providing additional value due to the extended temperature range and higher reliability. The combination of comprehensive functions providing maximum flexibility together with the higher quality of the FlexDSL MiniFlex makes it the perfect choice for your access needs. MiniFlex SHDSL- Geräte von FlexDSL gibt es in sehr vielen Ausführungen. Fragen Sie uns, wir beraten Sie gerne. Power: 18 to 72VDC or 85 to 264VAC & 120 to 370VDC, 4W Typ. Weiterführende Links zu "MiniFlex SHDSL.bis DIN-Rail Modem"
Kundenbewertungen für "MiniFlex SHDSL.bis DIN-Rail Modem"